bike | Next goal wins laaaaaaads! bike lanes from Casey Neistat on Vimeo. I have been meaning to blog this for a while, but being in the Bike Capital of the UK made me drag this out of my drafts archive. As for the $50 fine, I wonder if he got it back? Bikes – the man who lived on one. Vimeo.com is a great source of interesting videos. The “staff pick” button is a great option as the best of the latest offerings on the site have been cherry picked for you. THE MAN WHO LIVED ON HIS BIKE from Guillaume Blanchet on Vimeo. Heroes are people who inspire and make your jaw drop. One can only admire his grit and determination to get to that finish line first. He still has time to raise his hand to show how many stage wins he has chalked up on this race so far. You get some right tight-fisted people out there. Here is an example of how mean spirited people can be. 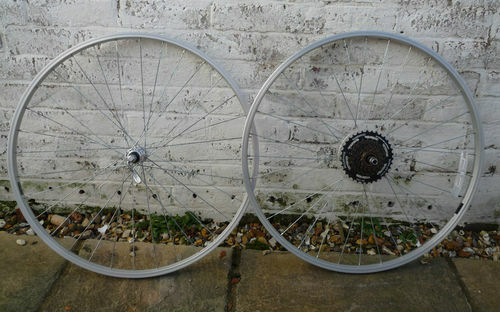 Wheelset no longer needed after upgrade on a town/hybrid bike. They still run ok and have not got many miles on the clock, but have the wear and tear from the potholes and bumps on today’s roads. Good enough to have been kept as spares they are going out after a Spring clean the shed. They are too good to be binned, but too bulky to be kept as spares, as I am becoming a fair weather cyclist and now also have another bike. NOTE – I AM OFFERING THESE FOR A CHARITY 100% SALE. Please note that these are collection only. Now the bidding has been set to start at 1 pence and there is a big banner showing the charity logo for Red Nose Day saying that 100% of the proceeds of the sale go to the Red Nose Day appeal, yet one person out of the 11 people that have viewed these wheels so far has put it on their Watch list! Whaaaaat? There is some tightwad out there somewhere who is waiting to jump in last minute and get a penny bargain? Listen up whoever you may be. They are a cheap pair of wheels and a good deal if you can get them for a few of quid, even if you just salvage them for spares. However that is not the point. Get into the spirit of the auction will you please! What with the fantastic results that the British Olympic track cyclists achieved and Bradley Wiggins winning le Tour along with further Gold in the Olympic time trial, Mark Cavendish has faded away from the public gaze of late. To me he is still a “Bike Hero” nevertheless. The stage win in the video came after huge effort from his team to drag him to a point where he could strike. This final sprint of his is truly heroic. Notice the guys at the front that Cavendish catches with about 50 metres to go just watch him go past, as they know that they have no answers to his raw pace. The commentators clearly enjoyed watching the race reach its climax – “…and here comes the Missile!” shouts Phil Liggett. The video might need watching a second time when one can focus on where Cavendish comes from. Now I take my hat off to people who have brainwaves and act upon them. So well done to the folks at Revo. This system enables cyclists to see and be seen. But not only do these lights have the potential to save lives, but they look amazing. 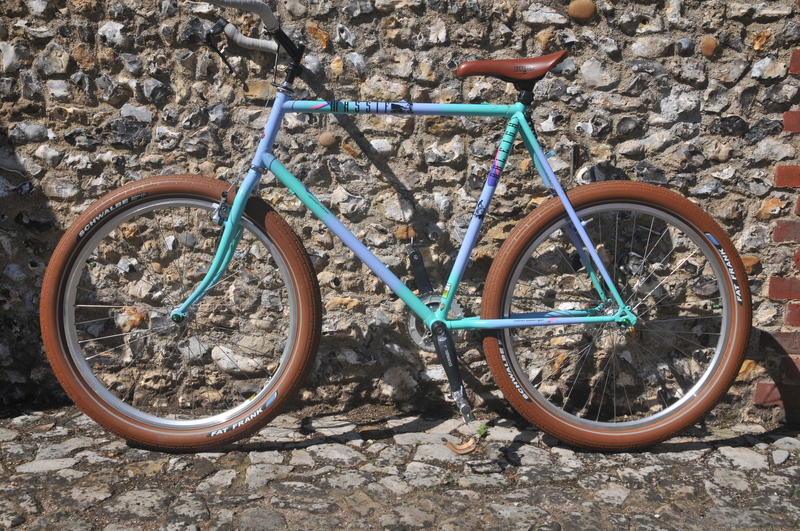 I got the Old Papershopcruiser out of the shed the other day and also found an unpublished video which is also posted. Seems ages ago that I made it. After hours of tinkering, trawling the internet for parts that fit that wretched Raleigh frame and consulting Sheldon Brown, the ultimate bike mechanic’s guru, the bike is now built. The way people react to you having Parkinson’s is different, but it helps if people just show a bit of empathy not sympathy. That goes a long way to making the sufferer calmer and happier. This is good as stress and confrontation can set a person with PD into a state with full blown symptoms. People with Parkinson’s try and hide the symptoms that they have and the drugs they take help mask the things that go wrong with their bodies. Rarely will a PD sufferer say anything about their problems – except to those that they love and trust. Big tip though if a PD sufferer asks for help, then they probably are in need. This almost stubborn denial of these problems that PD causes means that sufferers try and prove they can cope. This puts tremendous pressure on the nearest and dearest at times. They must cope too, as well as care. The random bloke has to cope with the ‘freezing’ that I am so used to that it has become part of my life – I hope that he is un-medicated, otherwise he is in a bad way. My hat goes off to him for allowing people to film him in that state. However the person that I say is the true hero is the woman looking on in the background. I assume it is his wife – the person who cares and has to deal with so much pain herself. Not many people out there are able to give that much of their heart and soul to someone else. This lad was best described as a “Dandy” – one of his many nicknames was The Lion King, which helped paint the picture of this very self confident athlete with his mane of curly hair and wrap around shades. He oozed sauve style, posessed a real sense of arrogance and was a natural team leader. All in all he was a great athlete and a bit of a bully if truth be told. 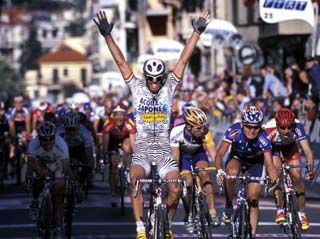 Still he made the Italian cycling fans proud in 2002 in a brutal finish to the World Championships…….